The ViewSonic VA2446-LED is a 24” (23.6 Vis) widescreen monitor with an LED backlight and glossy, thin-bezel design ideal for use in the home or at the office. With Full HD 1920x1080 resolution and a 10M:1 dynamic contrast ratio, the VA2446-LED delivers stunning brightness and contrast, while a quick 5ms response time ensures crisp pictures and smooth playback. VGA and DVI inputs provide flexible and convenient connectivity, while a VESA-mountable design offers additional mount flexibility. With an efficient LED backlight and energy-saving Eco mode, the VA2446-LED is an environmentally friendly display choice. In addition, a 2-year warranty, along with one of the industry’s best pixel performance policies provides great value for the stylish, high-performance VA2446-LED display. Experience stunning clarity and detail with high-definition office, graphic design, video production, gaming and multimedia applications on ViewSonic’s VA2446-LED monitor. It features Full HD 1920x1080p resolution to ensure excellent pixel-by-pixel image performance, while its 10,000,000:1 Mega Dynamic Contrast Ratio guarantees accurate image reproduction with rich, vibrant visual effects. The VA2446-LED is environmentally sound, complete with an energy-saving mercury-free LED backlight and Eco-mode. 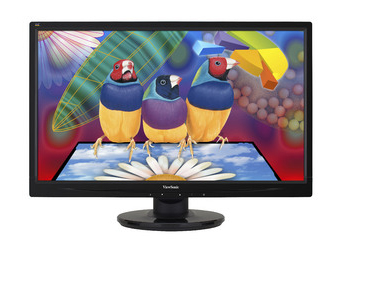 Its ENERGY STAR® certification means you save up to 40% in energy costs when compared to regular 24" monitors. ViewSonic’s proprietary Eco-mode function gives you the choice to optimize (85%) or conserve (65%) energy, thus reducing display brightness and conserving energy by up to 30%. Especially in low ambient light, Eco-mode adjusts brightness and improves visibility while reducing eye fatigue and prolonging the display's lamp life. Designed for use in various settings, the VA2446-LED’s robust design makes it safe and secure wherever it is installed. That’s because it comes with a Kensington security lock slot and is VESA wall mount compliant – making it the perfect monitor for all office and public settings.